In July 2013, in an interview to Reuters, Narendra Modi stated he’s a Hindu and a Nationalist and therefore a “Hindu Nationalist”. Many political parties opposed to BJP and the media slammed this statement as if being a Hindu nationalist was some big crime. Ever since then, and especially after events at JNU anti-India slogans, there is a rage among Sickulars and their media cronies deriding nationalism as some kind of evil. Some even claim nationalism is anti-democracy. That’s how stupid it can get when their masters are out of power and they have to cling to all kinds of silly arguments. So what exactly is nationalism? And why do Sickulars keep ranting it is incompatible with democracy? In simple terms, nationalism is just an ideology that binds people of a nation together. Democracy is a form of govt and a form of life-practice too. We will get deeper into this in a bit. See what I mean? LIE through the teeth like there’s no tomorrow. Firstly, how is India not free or ModiSarkar restricting FoE? This woman blabbers all the nonsense and lies she wants. Media abuses Modi and his govt day in and day out. What more does she want? Everyone knows about the fake campaigns of Christians under attack and the bogus intolerance campaign. And there is no FoE? That’s not all. Aruna Roy even claims UR Ananthamurthy was targeted by SM with a one-way ticket to Pak because Modi wasn’t his choice for PM. Is that the truth? This liar Roy doesn’t mention that URA grandly threatened he would leave India if Modi became PM and that’s why he was gifted that ticket. She also claims she had criticised the previous Congress govt on many occasions. LIAR! She was one of the members of Sonia’s private coterie called NAC. And if she was at Jantar Mantar for the IAC rallies of Kejriwal & Co. it’s only as a visitor because those Johnies were her close friends and associates and she wasn’t protesting anything. Consensus among whom? A bunch of Sickos cut from the same cloth? Why do they even have such debates when the only guys there would be folks from the same hammam or gutter? Still, on what basis did they conclude nationalism divides? Nationalism is not evil – individuals and groups can be evil. And I see such evil individuals and groups in the media and politics every single day. Before we go any further it should be known that pundits have, over the years, identified many different types of nationalism – there are at least a dozen types. Indians and Hindus (which includes religions of Indian origin) relate to a nationalism of shared culture, patriotism and putting country first. I have not met a single person from the Hindu culture who has ever put his religion above country – none! Liars like Rajdeep will not tell you who puts religion above country, Constitution, national symbols and anthems. Democracy is a form of governance and can also be a life-practice. Democratic practices can be in govt, in corporations, in schools and at home too. It does not conflict with nationalism. There are shootings, murders and rapes almost every week in the US. Do these Sickos call it a failed democracy? And which law in India allows any kind of “vigilantism” let alone about cows? If you ask this question they will claim the journalistic right to crap nonsense without being pilloried. Which democracy doesn’t have a problem? Democracy itself is meant to be imperfect and slow in its nature. Those Sickos, because of their hatred, that call India a failed democracy for flimsy reasons are as much anti-nationals as those who shout “Bharat ki barbadi tak” and this applies to people like Rajdeep and all those media goons who trash India rather than the problem or a particular govt. And when it comes to sucking up to Pak, ISI or indirectly promoting the agenda of Hafiz Saab, can NDTV be ever far behind? India is about to celebrate her 70th Independence Day and all that the NDTV jerks can debate is why giant flags or Rakhis at the border. Mind you, the Rakhis are for our Jawans. What is there to debate about this? Apart from being petty, this, for me, constitutes anti-national behaviour of the most third-rate kind. There is no purpose or objective except to tar the govt and the country with nonsensical statements and debates. Even dictators like Hitler or Mussolini have promoted aggressive nationalism of a different kind. That is not comparable to nationalism in a democracy. 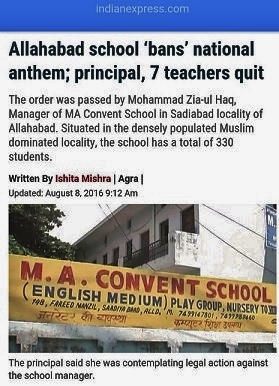 What’s the problem with these Sickulars? The fact that their elite snobs have been voted out and a man of ordinary background is PM. The elites who blabber most about nationalism being “jingoism” or anti-democracy have fed on the blood and toil of ordinary people. People like Shobhaa De who pour scorn on athletes from middle-class or extremely poor families who had to fight hard to get somewhere. Athletes that wear our flag which means nothing to elites. Democracy is meant to defeat such elites who only have place in a Communist Tabela. Modi is a publicly “elected” PM, not an “appointed” PM and that is the big difference. These are symbols of nationalism and not of democracy. The level of nationalism among individuals may vary. Nationalism practiced by different countries need not be the same. But in India, democracy and nationalism are perfectly compatible except for those who have vested interests and the motivation to break India. Feasting at the Pak High Commission even after learning about jawans being killed at Pampore is clearly anti-national. Glorifying convicted terrorists is anti-national. Wanting India in pieces is anti-national. Calling Maj Gen. GD Bakshi, who fought for India, a hate-monger because he trashed Pak is anti-national. Those who promoted that IIT-M lout for his stupidity are also anti-nationals. Those who concoct conspiracies to create fear among masses and tarnish India abroad for no genuine reason are also anti-nationals. Most of all, disrespecting our national anthem, poisoning young minds against it, disrespecting our national song and our flag is the most anti-national act. Doesn’t matter if one is not a nationalist by any definition but it is important that anti-nationals are not tolerated. I have been following you so long and forwarding links but somuch of liberalism seeped through into the brains of average indian that even bjp spokies are afraid to show their strength. Tjey talk like fiberalsModiji doeasnt change track damn backlash will be too bad. Why i still dont understand why bjp spokies are not taking the bahumat they got was hindu consolidation of votes. If they dont assert and just talk about dev then god help bjp deep state will digest them. Only peace i have is rss as an organization still exists and worried if 2019 because of modi trying to be fiberal looses.god save the country. Ravinarji keep doing we lay loose a battle but i sure if np modi may be some one else. If he failed us we will have another Shivaji we will have most peaceful Bharat and we are destined to be. Thos burkha gang and all are all peanuts. You are too good sir...you hit them where it hurts! Among your best writings so far. Explains lots of grey areas with absolute clarity. Sir, we already know all the things that explained in this article. If I were to write an article about the current political discourse in India, It would be more or less the same as you. We are observing things too. But I know it doesn't matter how much we write or have conversations with anti-nationals because we know that they're not stupid..they are observing things just like we are. The anti-nationals have already DECIDED to be this way and nothing's going to change that no matter how much we write about it. The question is not whether they're nationalists or anti-nationalists anymore. We are way past that. The new question is ....what actions are we willing to take against such entities as proud citizens of this country and what actions have we taken against them thus far? And trolling them on twitter doesn't really count as real "Action". We need to find them and we need to EXAMINE them. Observe them and find out what is making them take just odd actions. Find the source of it. May be a bigger game is being played through them. May be they're getting support from foreign entities. First we need to have a platform where we can keep a list of people like Barkha Dutt, Rajdeep ,Shekhar Gupta etc .. We should also be able to add people to that list subsequently as we find them. And then we can independently investigate them. We need to form an organizational body to regulate the investigation. We cannot depend on the govt since govt is either weak or itself is involved in this game ..who knows? The investigation of the above anti nationals should include medical tests including a head scan to find out how much filth fills their brain and the degree of mutation of their neurons and DNAs. 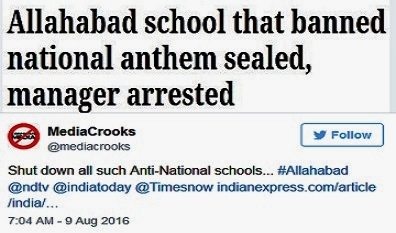 In a democracy like India, the best way to defeat these anti nationals is to robe them of their credibility. Why each & every one of the journalists you mentioned is whining vociferously against Social Media? Precisely because some gifted authors like Ravinar have decided to call their bluff in public. They are doing it day in day out in blogs, twitter. If they loose their credibility (they have already lost most) completely, they will be less harmful. Earlier they had a field day. 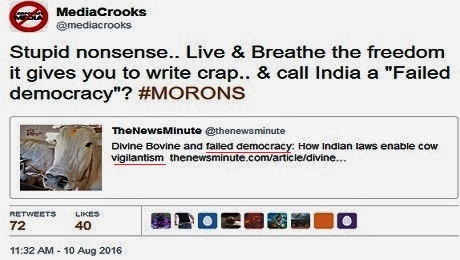 "Mediacrooks" is doing exactly what you are proposing here. Add binayak send and Prashant Bhushan also in your list. Thank you, from my heart, for this excellent article..Hope it will have some effect, at least on some Modi haters..
Vande Mataram, Jai hind. I will never tolerate anti nationals. I bow before you, Ravinar, for the blog which tears apart our 'Nationalism Haters'. It is very appropriate that you should have written it on the eve of our Independence Day. Every Indian should read it. May God bless you with long and healthy life. NO EXCUSE in complaining - being a democracy, laggard & hands-in-glove corrupt bureaucratic system, anti national media and suddenly vigilant courts have all played parts in portraying nothing moving against the corrupts. That's what happens if you play nice and by the rules. You can't be a winner by consensus. You have to knock them down - killer instinct. Modi has to break rules in order to be a clear winner. Nobody lets you be a winner by consensus.
. He tries to communicate with people by many means and his message is simple, advancement. The presstitutes have become immune to your blogs now. Maybe you need to take this one step forward and expose media in talks n lectures at various places..
Snobbery and anti-nationalism actually has its roots in christians first through their convent education which Macaulay brought in perfected by Nehruvian appeasement of Muslims which should be given first right to resources according to the appointed PM MMS. Most of the current day media started earning by eating from fingers of such chrislamists which Ravinar identified long time ago and the whole game is now opened threadbare by him. Kudos! Many heads who must be feeling ashamed in so called Hindi Medium Types and suave punditry against real nationalism would be able to raise heads high. In last 15-20 years (After Rajiv Gandhi-from PV Narsimha Rao) nationalism started getting rooted, furthered with APJ Abdul Kalam, promoted by Narendra Modi now. Lets see if we contribute our bit to take it to right heights. And yeah rant against democracy in the guise of protecting nationalism must not be tolerated at all as that becomes anti-nationalistic and anti India what these commies Rajdeep, Congis have been spreading. PS: Loved the term "Communist Tabela" I call them Phukte [फुकटे]. Never done anything productive in their live. A fantastic reply to antiNationals who r yelling in Modiraj.Sardesai n his kind of presstitutes hv lost sanity.SM led by Mediacrook is their nightmare now. Every word.. every statement should be allowed to sink in to feel its effect..Great Ravinar sir..You give words to our feelings. Thank you. "Ask not what your country can do for you, ask what you can do for your country". According to illiterate, spinner monkey balancer type media, these words were from anti democratic communist country and not from the great democratic country USA. The democracy is an evalutory system of governance used and practised in national interest and for civilizational advancement and can be updated by new better system in the best national interest and for advancement of civilization as India can do http://www.ivarta.com/columns/OL_040104.htm (Raam and Aam rajya, India's next contribution to world civilization). So national interest, Which is primary objective is called nationalism and monkey balancer type prestitutes and polsitutes are anti-nationals and should not be tolerated in updated advanced better system of governance in finding challenging mutation to changes. I always follow it blogs sir. One of the best blogs written with filled patriotism. Exposing anti nationals completely, after their own self exposes. Kanhaiya Kumar's #Bhakts are downrating #BiharToTihar. I am Kanhaiya Kumar, native of Bihar. I am doing PhD on a very important subject “Mating habits of gay chimpanzees in West Africa” at PANU University, the best University in India and possibly the best University in the world. My idols are “Faizal Guru”, “Janab Kasab Sahib”, “Focus Carat”, “Baba Badkar”, “Zakir Nalayak”, “Gharkha Dutt”, “Dr. Kana Ayyub” and all PhD students who had committed suicide since they failed to solve their PhD problems. I personally feel that, all deprived Indians should automatically be awarded a PhD degree coupled with a free pension of 1 lakh rupees/month to be delivered in cash via post at door step. Till then we are going to fight for azaadi from India. Imagine a day, when no PhD student would have to commit suicide, imagine a day, when no lower caste will be humiliated by upper caste, s/he can use his/her doctorate degree and force others to call him/her Dr. X, Dr. Y ,etc. Imagine a day, when all deprived people can take part in active politics and “Make Communism Great Again” thanks to my “one lakh per month” pension idea. Aruna Roy blabbers lies about this government because she was a 'power' in previous government as head of NAC, a nominated post! Put there by a party chief and not the government of the day! Now what is she? Nobody! Her rant is about her own loss of power and importance and let her go on and on who cares! JNU agitation, made treason, a virtue in the name of FOE.Today anti national slogans are mainstream thanks to the govt's apathy to it last year.The next stumbling block in the path of breaking the country is the nationalism displayed by the RW indians. So Now is the time to demolish nationalism as a vice to be condemned.One this is acheived, then it will be a free for all and flood gates will open for the jihadi commie combine to destroy the nation. These leftist, elitist snobs hate that anyone from an ordinary background should achieve anything purely by their own talent and hard work. Modi does not need them. That hurts them so much! I saw the video on you tube, Aruna Roy can best be described as a lunatic. She's better off in a lunatic asylum. wondering if these anti nationals are baptised secretly under black oath after successfully completing a crash course in Ultra Mind Con trol programme. india will not join the NWO of the reptilean hi breed.They think they r above the law of any country. They have been kicked out of Russia n China. Now its india time to kick them out. Do check the Outh of Black Pope. When 9/11 occurred and the country found out that the perpetrators are from Afghanistan a nationalistic Govt and country immediately attacked the enemy country. Compare this to 26/11 and the Indian response. In India nationalism is shown more vociferously in talk but less in action when chips are down. Well said.They are trying to discover their relevance.Being nationalist or anti nationalist does not matter.What matters is keep hitting Modi/BJP/RSS/Hindus.This game may end around 2020. Trolling the traitors in media and making mock shows on these traitors will surely help and automatically make them feel ashamed and if this passed on to their next generations (their children & grand children) then fantastic. Mock show to include traitor's children questioning their own parents on anti-india behavior. BJP Govt & Modi to ignore the side thrusts of these traitors and keep doing their activity behind the scenes with lowest noise and loudest actions. Paid media is already on backfoot for their inability to make any impact on the voters, nor their anti-BJP industry made any impact on the Pappu. Suspect Pappu is a gay. It is already well known that Nehru family has inherited unknown DNA. Pappu even if married will have to borrow or loan some Venuzeula DNA. Ever notice in all interviews, discussion & shows, Burka Dutt rants almost 40% of the time. Waiting for BJP govt to get majority in Rajya Sabha and then abolish the Kashmir special status, declare Hindu state and make amendments in constitution so that these infidels & traitors can be punished without much rumblings. The strategy adopted by NDTV for many years is to attract youth by engaging them in mock debates, selective covering of tennis, soccer games, mindless commentary debates on who is the greatest cricketer Sachin or Bradman or Vivian Richards or discussion bollywood young actresses (no actors), go to slump areas with camera and take photos of pot holes & stagnant water and ask the residents what did the govt do for them (often in BJP ruled cities or states), and some street investigation stories by oscar nominee Srinivas Jain. Interestingly there is definite time every day & week that is spent in covering the above topics with Lipstick dark beauty Burka Dutt whose face will bring sorrow in any happy person, make crying babies to become calm. Gone were the days where mothers used to invoke Gabbar Singh. Now thanks to these media, it is now Gabbar Singh is replaced by Burka Dutt. If school going children not waking up in time, then mothers triggers in Arnab Goswami noisy alarms !! making children do spring jump !! The strategy adopted by NDTV for many years is to attract youth by engaging them in mock debates, selective covering of tennis, soccer games, mindless commentary debates on who is the greatest cricketer Sachin or Bradman or Vivian Richards or discussion with bollywood young actresses (no actors), go to slum areas with camera and take photos of pot holes & stagnant water and ask the residents what did the govt do for them (often in BJP ruled cities or states), and some street investigation stories by oscar nominee Srinivasan Jain. Interestingly there is definite time every day & week that is spent in covering the above topics with Lipstick dark beauty Burka Dutt whose face will bring sorrow in any happy person, make crying babies to become calm (buck or crying stops "inside"Burka). Gone were the days where mothers used to invoke Gabbar Singh. Now thanks to these media, it is now Gabbar Singh is replaced by Burka Dutt. If school going children not waking up in time, then mothers triggers in Arnab Goswami noisy alarms !! making children do spring jump ! !